Publisher of retro-style adventure games, Wadjet Eye Games, and New York-based Indie Developer Grundislav Games (Francisco Gonzalez) have announced today that they have released their point and click adventure game, A Golden Wake, for PC, Mac, and Linux. The download is DRM-free and you can get the game via the official site, or purchase from Steam and GOG for $14.99. In A Golden Wake, players will follow the role of Alfie Banks and will experience a game that is set in Miami during the roaring ’20s in the community of Coral Gables, Florida (The City Beautiful), where the real estate market is booming. 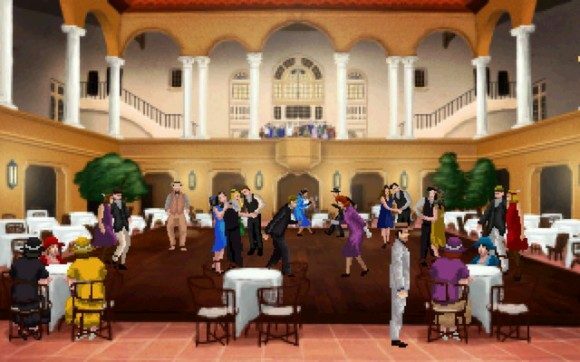 Now is your chance to get in on this time and live the American Dream and strike it rich through a Jazz Age and puzzle point and click style game. With every dream comes a struggle, and that struggle in this game is to go head-to-head with real estate mogul George Merrick, you will need to deal with corrupt politicians, and even have some problems with the mob, though people aren’t the only challenges, because you will also have to deal with the hurricanes that wrecked the Florida coast. Ready to start the American Dream and lead to success and challenges in this point and click adventure game, all in your very own Model T?! You can find out more information on A Golden Wake’s official site. Plus you can like Wadjet Eye Games on Facebook and follow them on Twitter on A Golden Wake and other games.